An American Airlines plane taxiing to Terminal A at Dallas/Fort Worth International Airport slid off the taxiway and got stuck in the grass Monday night. Lynn Lunsford, with the Federal Aviation Administration, confirmed to NBC 5 the front nose gear slipped off the taxiway as the airplane turned a corner and became stuck in the grass. Airline officials said there were 63 passengers and a crew of five onboard Flight 296 from San Antonio. All of the passengers were deplaned safely and taken by bus to the terminal. 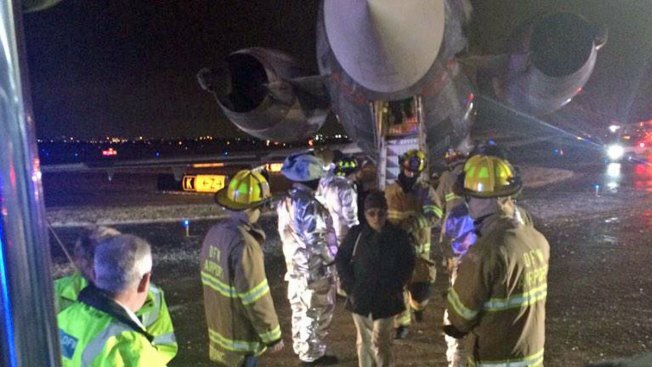 The plane, an MD-80, had to be dislodged and towed. "As soon as we hit the ground, we slid to the left," said passenger Danelle Canales, of Dallas. Canales said she was reading a book and didn't at first realize what had happened. Then the pilot came on over the public address speaker, explained the situation and said, "We tested the brakes and they were fine, but when we landed, we had no control over the brakes." Canales said another passengers told her they could see the front wheel turned to the side. Airline officials have not confirmed what caused the plane to slip off the taxiway, however, up to an inch of sleet fell on North Texas overnight Monday, covering much of the Metroplex in ice. Since that time, DFW Airport's Airfield Operations crew has been working to keep runways open and taxiways clear of ice. The airline canceled more than 1,000 flights Monday due to weather. A man who said his friend was a passsnger on the flight tweeted a photo of passengers exiting the aircraft through the emergency exit at the back of the plane. We will update this story with more information as soon as it's available. As this story is developing, elements may change.